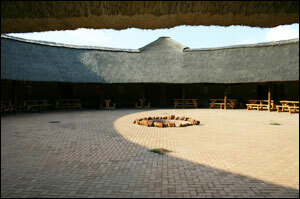 Our traditional African Lapa is situated in the middle of Nan Hua Village. It is fully equipped with all amenities, like a kitchen, cloakrooms, and a fire-pit in the center. There is also a glassed-in area which is very useful, should it begin to rain unexpectedly. We will provide you with chairs, tables etc. A sound system can also be arranged. The lapa can accommodate up to 300 people and is a superb venue, especially on summer evenings, when the starry sky is displayed above, or on clear, winter days. As with all our venues, advise us of your requirements and we will do our best to arrange everything for you.